Consequently, we are committed to providing our students with an opportunity to develop in all components of Life Long Qualities for Learners outlined in The Framework for Lutheran Schools (LEA, 2005) as below. 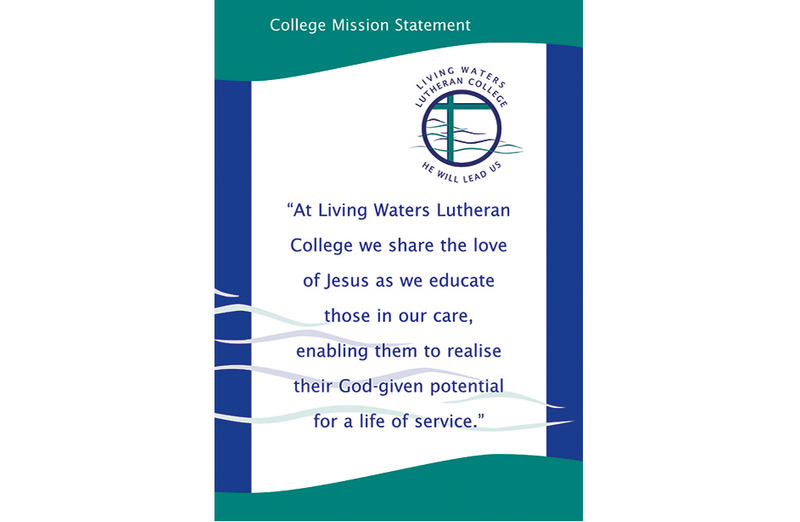 As central to its mission and ministry Living Waters Lutheran College seeks to nurture individuals, who are aware of their humanity, open to the influence of the Holy Spirit, and growing and living according to a cohesive world‐wide view. Self‐directed and insightful investigators and learners. Discerning, resourceful problem solvers and implementers. Open, responsive communicators and facilitators. Principled, resilient leaders and collaborators. Caring, steadfast supporters and advocates. For full details on the Lifelong Qualities for Learners please see the pamphlet A Vision For Learners and Learning in Lutheran Schools, A Framework for Lutheran Schools. strive to be a means of support to parents who seek to raise their children as Christians living in the wider community. give opportunities for students to explore God’s love for them in Jesus Christ and His relevance for their own lives. provide students with an education in a caring, Christian environment. maintain a high standard of education which caters for the spiritual, intellectual, physical, emotional and social needs of each student. provide students with a foundation for their future education and personal growth. instruction in the Christian Faith as taught by the Lutheran Church of Australia, in a genuine and open learning environment where views are shared, discussed and respected. opportunities to participate in worship and prayer through class devotions and chapel services in a way that is relevant and meaningful to them. the employment of staff members who are committed to the aims of the college. instruction in all curriculum areas, as required by the Education Department of Western Australia for a well-rounded education. the establishment of appropriate channels which enable open communication between staff and parents. the adoption of an effective code of discipline which places an emphasis on self discipline and positive reinforcement of good behaviour, while recognising that all students have a right to learn in a well-ordered, well-disciplined environment. works as a team with parents. Lutheran Education Australia consists of schools and early childhood centres, regional offices and the national office, all directed to make available to Australian communities ‘a formal education in which the gospel of Jesus Christ informs all learning and teaching, all human relationships, and all activities in the school.’ [LCA & Its Schools DSTOII, edited 2004]. Our schools are charged to deliver an education that is faithful to our Lutheran ethos and reflects the unique context of its local community. Our regions are charged to support and provide leadership for our schools, ensuring that they are faithful to their mission, while representing them regionally to Church, governments and related agencies. Our national board and office is charged to develop policy and to take initiatives that enhances our schools as schools of the LCA, while representing Lutheran schools and regions nationally to Church, government and related agencies. To find out more about Lutheran Schools visit the Lutheran Schools SA/NT/WA website.